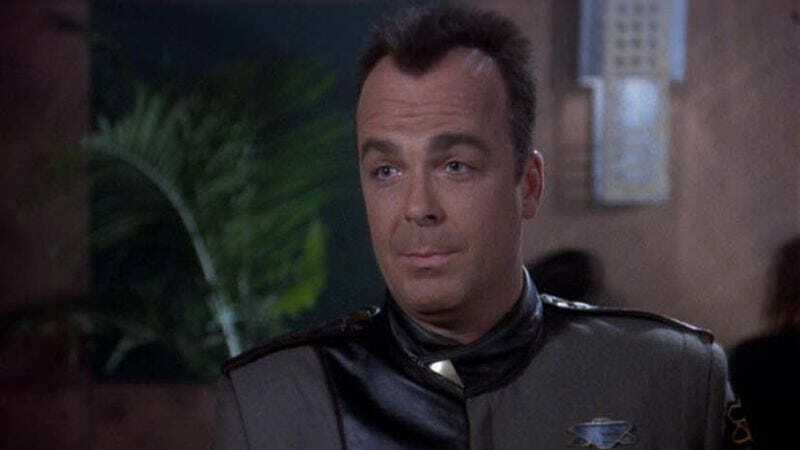 Variety is reporting that Jerry Doyle, an actor and radio talk show host best known for his role as properly paranoid, down-to-Earth security chief Michael Garibaldi on the cult-classic sci-fi show Babylon 5, has died. Doyle, 60, was found unresponsive in his Las Vegas home on Wednesday night. Doyle transitioned into acting in his mid-30s, after stints as a corporate jet pilot and stockbroker. His first TV role was on Moonlighting, where he played a potential replacement for Bruce Willis (with whom he shared a burly frame and close-cropped hair) in one of the show’s typically meta-textual late-season gags. A few years later, he secured the role of the titular space station’s head of security on Babylon 5: The Gathering, J. Michael Straczynski’s TV-movie trial balloon for an ongoing Babylon 5 show. As Garibaldi, Doyle served as a grounding element for a show that was as interested in human foibles as intergalactic diplomacy and trade. Suspicious but warm, funny while being deeply cynical, and utterly loyal despite being driven by his own individualistic impulses, Doyle’s Garibaldi was a constant reminder that human nature couldn’t be solved by something as simple as a transition to the stars. The show often tapped Doyle to provide some of its most painful pathos—as in a late-season plot line that saw his best qualities twisted and manipulated until he betrayed his closest friends—but it also relied on Doyle’s easy way with a punchline or faux noir one-liner for many of its biggest laughs. Several of Doyle’s Babylon 5 castmates expressed their sadness and condolences on social media today, with Bruce Boxleitner and Claudia Christian both posting short tributes to their old co-star. After Babylon 5 wrapped, the deeply conservative Doyle ran for a seat in the House of Representatives. (Straczynski says, “When Jerry ran for congress as a Republican not long after Babylon 5 ended, I donated to his campaign. Not because I agreed with him, but because I respected him.”) Several years after losing the race to California’s Brad Sherman, Doyle settled into his role as a nationally syndicated host for the politically conservative Talk Radio Network. Beginning in 2012, Doyle’s caller-driven show—strongly informed by his right-leaning political views—was one of the network’s most successful performers. Doyle’s family confirmed his death today on social media.